We've gotten away from our bread and better the last couple weeks, so we're going to hook you up with a quick breakdown of everything going on in Michigan sports. • It was almost a year ago to the day we "heard" about the Kitten Killer at Syracuse. 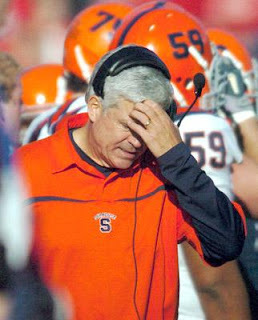 Well, let's just say it's a very cruel twist of fate that Greg Robinson is now Michigan's defensive coordinator. MGoBlog has a complete breakdown of the hire, including Robinson's alarming defensive stats over the past couple years. Does he have great credentials as a DC? Certainly. But when you combine two guys that both went 3-9 last year, let's just say this isn't the offseason spark we were looking for. • What is going on with Corperryale Harris? Over the past 4 games, he's shot a paltry 34% from the field (16-47). Beilein says everyone's overreacting: "I see these matchups on TV and who’s leading the Big Ten (in scoring), that is not a stat that should be (relevant.) It should be are we winning games? So, not at all." Note to coach Beilein: We HAVEN'T been winning games! Anywho, right now we're among Joe Lunardi's Last 4 In and it appears we'll be sweating out a bid all the way up until Selection Sunday. And yes, it makes us sick too to cheer for Duke. • Poor Steve Kampfer. The dude gets body slammed by Mike Milano in the fall, then almost gets his neck broken in a hockey game this past weekend. And why is Kampfer's dad the one apologizing for confronting MSU's Corey Tropp in the locker room? • Tajh Boyd is about to commit to either Ohio State, Clemson or Oregon today. As previously stated, I'm going to hurl if he ends up at Ohio State. That would be BACK-TO-BACK MVPs OF THE U.S. ARMY BOWL, both at quarterback! While it seems crazy to follow Pryor, it actually makes perfect sense. Boyd will redshirt this year, Pryor will likely be gone by his junior year, and then Boyd gets three years as a starter. Hey, maybe we'll be able to beat the Bucks by 2014! • Props to Daily sports writer Dan Feldman. I've never met the guy, but to have your blog picked up by ESPN within a year is pretty outstanding. • It's way too early for a Super Sleeper in this year's NCAA Tournament, but we'll throw you a bone, people. We're really impressed by the Buffalo Bulls. That's right, Buffalo. They've already downed Temple, played Connecticut close (L, 68-64) and won 9 out of their last 11.